All the palaver about off shore companies can feel a little distant at times but you can just walk up to the door of many Kings Cross properties and experience it for yourself. 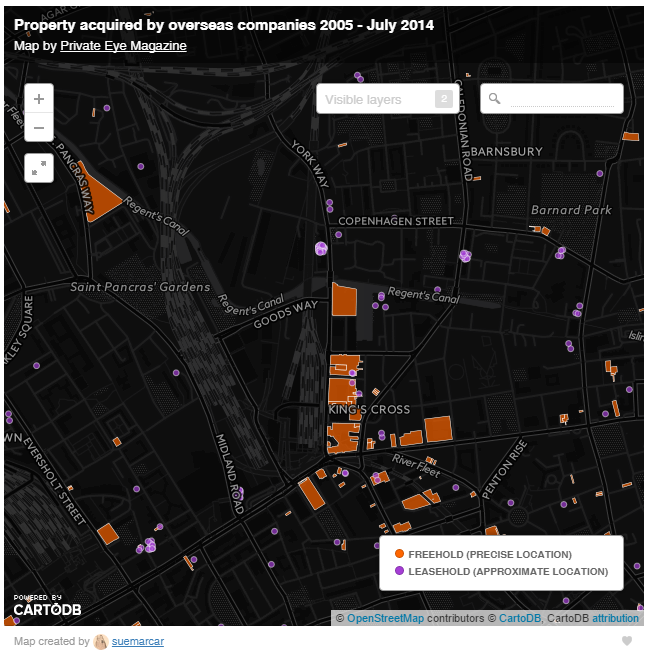 Private Eye produced a map of property acquired by overseas companies using Land Registry data. If you zoom in there is a cluster of leasehold blobs half way up York Way (just beyond the Guardian building – owned by a German company) on the left, in the Arthouse Building. Arthouse was one of the first residential properties in the Kings Cross re-development to be marketed. And by the looks of things it was marketed hard overseas and a good number of buyers availed themselves of corporate vehicles to hold the properties in a variety of places around the world – from the British Virgin Islands and Seychelles to Samoa via Singapore. 32 properties according to the Private Eye presentation of the Land Registry data. 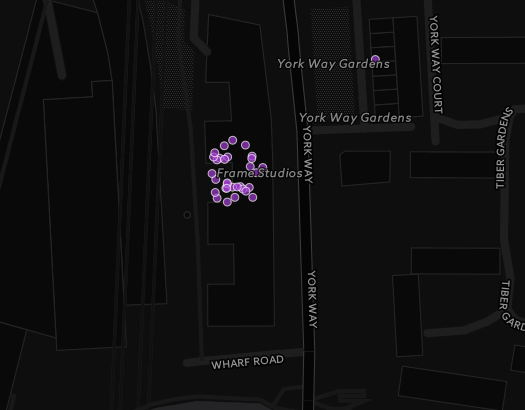 There are other clusters of off shore ownership in Kings Cross. One can enter the names of the companies into the new database of offshore leaks by the the International Consortium of Investigative Journalists and one or two show up there. So, for instance Key Navigation Consultants a British Virgin Islands registered company bought Apartment A3-4 at the Arthouse in January 2014 for just over £1 million. The ICIJ database search yields for a company of that name a network map at the time the data was gathered (see the ICIJ caveats on their site). So what does all this mean? On the one hand there is great international confidence in Kings Cross as a place to invest – I see that even a vacant lot on Randells Road (the old dry cleaners) is owned by a British Virgin Islands company. On the other hand it shows that the days of just popping into the estate agent with a mortgage pre-approval are numbered, unless it’s the Road Town branch. This entry was posted in Architecture, Kings Cross N1C, railwayslands. Bookmark the permalink. As far as I can tell, from having looked at adverts for new-build residential property in the area (not just in N1C, but also in Regent Quarter – and most recently, on Caledonian Road) much of it is marketed overseas before it is marketed in the UK. And will this type of data still be accessible if plans to privatise the Land Registry are successful? the LAnd Registry privatisation thing is very odd. the minister said the other day the plan was to privatise the registry operations but NOT the data.